Directions Instill 1 or 2 drops in the affected eye(s) every 3 or 4 hours, or as directed by a physician. Store upright at 15-30 degrees C (59-86 degrees F). Keep tightly closed. 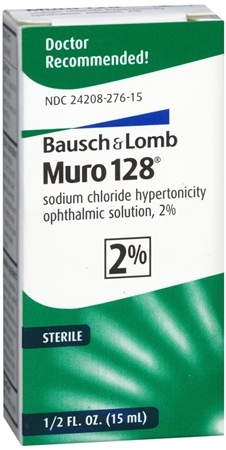 Uses Temporary relief of corneal edema. Doctor recommended. Warnings Do not use: except under the advice and supervision of a doctor, if solution changes color or becomes cloudy. When using this product: it may cause temporary burning and irritation, to avoid contamination do not touch tip of container to any surface, replace cap after use. Stop use and ask a doctor if: condition worsens or persists for more than 72 hours, you experience eye pain, changes in vision, continued redness or irritation of the eye. Keep out of reach of children. If swallowed, get medical help or contact a Poison Contol Center right away. Serious side effects associated with use of this product may be reported to 1-800-323-0000.